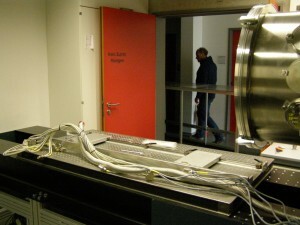 On March 18th we started to upgrade or unique SAXS/GISAXS instrument VAXSTER (Versatile Advanced X-ray Scattering instrumenT ERlangen). 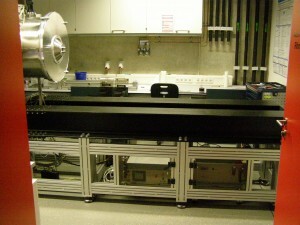 This includes the full rebuild of the primary instrument part with the 3/4 slit collimation system focusing X-ray mirror and the X-ray source. VAXSTER will become an extremely versatile combined SAXS/GISAXS/GIXD laboratory instrument with outstanding performance. It will be equipped with a MetalJet D2 70 kV X-ray source from EXCILLUM, Sweden. It allows for horizontal and vertical grazing incidence measurements within a fully evacuated setup or with a sample positioned at ambient conditions. 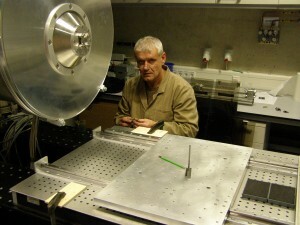 The beam will be shaped by a 150 mm Montel optics (INCOATEC, Geesthacht) and a set of up to 4 double slit systems with the last two slit systems equipped with low scattering blades (JJXray/SAXSLAB). 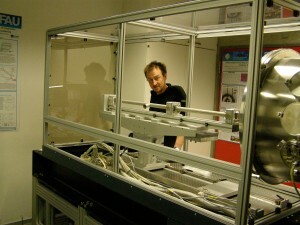 In the following you will find some photographs of the ongoing installation of VAXSTER.